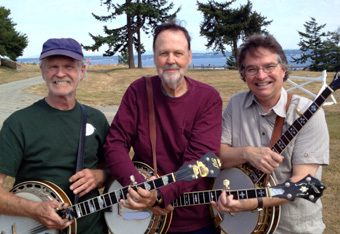 1:00 – 2:00 p.m. Getting Started With Rolls, Chords & Melodies with Alan Munde (beginner); Up The Neck Scruggs Essentials: Leads and Back Up with Bill Evans (intermediate); Developing Melodic Banjo with Bill Keith (advanced). 2:00 – 3:00 p.m. Bluegrass Banjo Phonetics: Rolls, Creating Solos and Backup with Alan Munde (beginner to intermediate); Surviving A Jam: Playing in Different Keys With and Without a Capo with Bill Evans (intermediate); From Scales & Modes to Licks & Breaks with Bill Keith (intermediate to advanced). 3:00 – 4:00 p.m. Make it Drive: Using The Forward Roll in Leads and Back-up with Bill Evans (beginner to intermediate); Fret Board Strategies: How Do I Know Where To Put My Fingers? (learn the names of the notes on the fret board, and identify and use diatonic chords in slow song solos and backup, intermediate to advanced) with Alan Munde; From Bluegrass to Western Swing: A New Slant on Chord Progressions with Bill Keith (advanced). 4:15 – 5:00 p.m. Grand Finale with Bill, Alan & Bill and all students: Q & A, playing requests and a concert preview. If you can stay for the 8 p.m. concert (and this is highly recommended! ), you'll be able to store your instrument in a secure location between the conclusion of the workshop and the end of the evening concert. Enjoy dinner in downtown Berkeley without having to carry your banjo around!